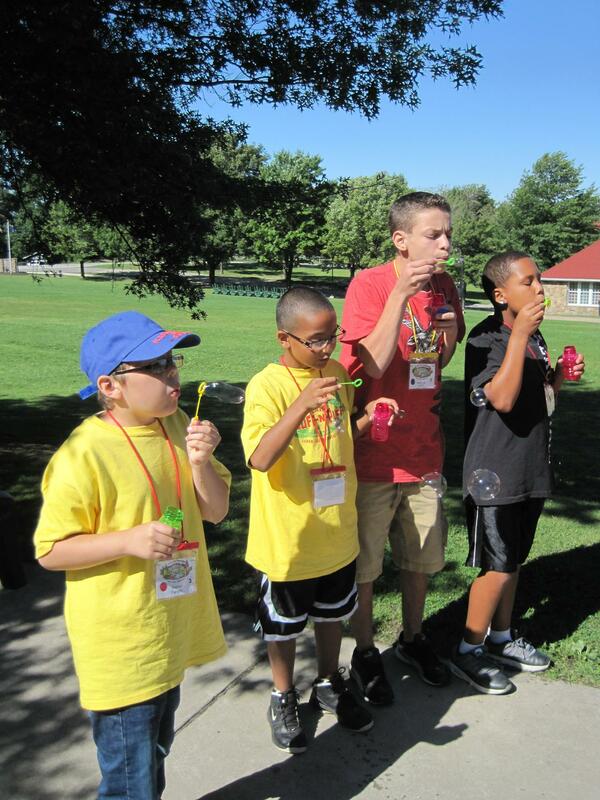 Kids at Camp Huff & Puff exercise their lungs by blowing bubbles. Living in Pittsburgh with asthma can be difficult with air quality alerts, high pollen and ragweed levels, and general city pollution. Triggers for this chronic inflammatory disease are everywhere and no one knows this better than the kids trying to run outside and play. In the past, many believed that children diagnosed with asthma should not be physically active. It was thought that the running and heat would cause an unnecessary increase in breathing problems. Yet 29 years ago, after parents expressed their fear of sending their children with asthma to summer camp, a new concept was born: Camp Huff-n-Puff. “Any child that has asthma can come to camp and learn to manage their asthma and become responsible. And they can learn how to verbalize their symptoms,” explains Camp Director Carol Ann Kuczma. In addition to all the campers, many staffers and camp counselors also have asthma. The camp provides a positive experience for children to learn about their lungs and their asthma while understanding that it doesn’t have to confine them. Camp Huff-n-Puff is sponsored by Breathe PA, with four built-in education sessions set up by age groups (one requirement is that children complete second grade for reading ability reasons). Instructors teach various topics, including breathing techniques and relaxation exercises. One popular technique is bubble blowing, where campers can visually see how long they can exhale to blow the biggest bubble in order to understand lung capacity. Campers are also taught how to recognize certain triggers for their asthma. “Everybody’s triggers are different and everybody’s symptoms are different,” says Kuczma, adding that while many campers are triggered by allergies resulting in trouble exhaling, others might respond more to weather changes resulting in chest tightness. Campers at Camp Huff-n-Puff are seen at least twice a day by medical staffers and have access to a 24/7 infirmary. Because medication has drastically improved since the inception of the camp almost thirty years ago, the campers are able to enjoy the full experience of summer camp while gaining confidence about, and control over their asthma. A new study out of the University of Pittsburgh may have found a way to treat asthma in patients that were not responding well to any other form of treatment. “This is perhaps the most remarkable efficacy study in asthma in the last 20 years,” said the study’s senior author and University of Pittsburgh Asthma Institute Director, Sally Wenzel. The study used the injectable drug dupilumab, which blocks part of the immune system. For 12 weeks, 100 patients were randomized to either take the drug or a placebo. Twenty-five million people in the United States have asthma, and that number is growing every year. Research by the Allegheny Health Network is now underway that examines whether high levels of particulate air pollution in the Pittsburgh area are connected to an increased number of asthma attacks known as exacerbations. Pittsburgh has taken great steps to move away from being one of the most polluted cities in the nation, but tiny fragments of pollution generated from the burning of fossil fuels called particulates still pose health problems for those with asthma.